I took my 220S Ponton sedan, "The Hoxter" to a friend's house tonight, and on the way home I picked up a small, green, hitch hiker. 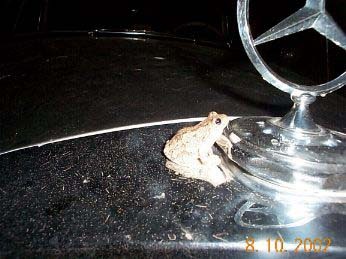 He sat and stared at the hood star all the way home. I guess he could not believe it was a Mercedes-Benz. I had to take a picture of him. Check It Out!